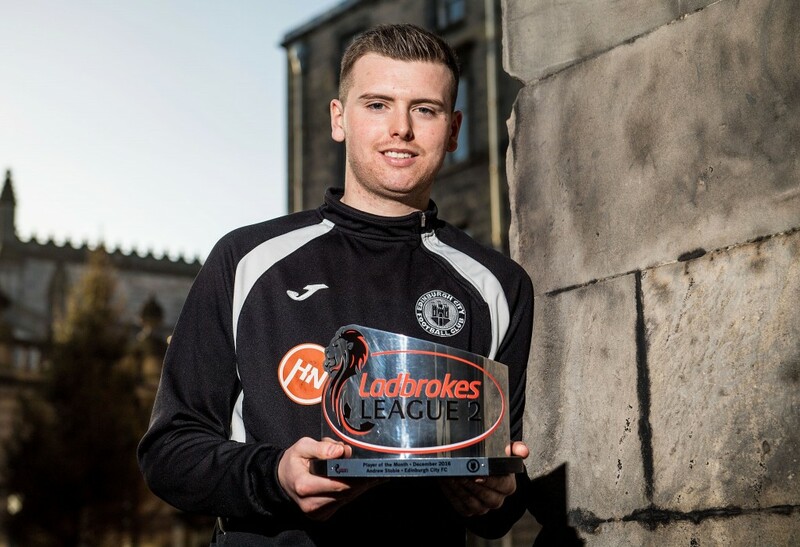 Andrew Stobie conceded just one goal as he picked up December’s Ladbrokes League 2 Player of the Month. But the Edinburgh City goalkeeper admits that he’s still getting stick from his team-mates for the award. Stobie and City were in fine form throughout the month of December as they won three and drew the other to move up into sixth in the table. That has them just four points off the play-off places – which now seems like an achievable target for the newly-promoted side who started the season without a victory in 11 league games. But City have turned it around, putting together an eight-game unbeaten run which led to an awards double over November and December. Gary Jardine got the rewards for steering the City ship while Marc Laird was November’s Player of the Month. But Stobie admitted that his team-mates weren’t convinced with his nod for December – because he’s a goalkeeper. Speaking in an exclusive interview with Ladbrokes News, Stobie said: “I’m proud to be given the award – but I was a bit shocked. It’s not often a goalkeeper gets a Player of the Month award. “The manager got recognised and, given how well the team played, any of us could have won it. “I’ll certainly take it, though, and I’m very proud. Stobie is a deserving winner after conceding just once in four games, but even he wasn’t aware of his strong form until actually finding out about the award. He told us: “I didn’t even realise until I got told about the award that I’d only conceded one goal in December. “You’d think it’d always be clean sheets on a goalie’s mind, but points on the board have always been the aim. It’s not until I sit back and think about it do I realise that I only conceded one. Stobie also hailed his manager for how well he’s been performing in his debut season in the Ladbrokes SPFL. Jardine led City to promotion from the Lowland League last term and the team’s form suggests they’ll continue as an SPFL team next season too. And Stobie picked out a key attribute of Jardine’s coaching – running. He added: “Gary was the joint-manager at first and he signed me in 2010, so I’ve been with him for nearly seven years. On the journey so to speak. “He’s a good man manager, knows his players and always had confidence in us that we’d turn it around. “He studies other teams thoroughly so we know who we’re coming up against and he’s not hesitant to change a formation or players if it’s not working. “But he’s a bit old school in that running seems like his favourite thing in football. “We’ve changed our training to a Monday-Thursday with better facilities and I think at the start of the season he was reluctant to run us because the game was so close to the Monday session. But he’s gone back to his old ways and the guys are getting a pounding on a Monday. “And it’s benefited us on a Saturday, we’re winning more and covering more ground as a team. City are 21/10 to take all three points against Cowdenbeath this weekend with The Blue Brazil 23/20 to secure a much-needed victory while the draw is a 5/2 shot.